Audio tape to digital transfer computer formats. Using our Ferrograph logic 7 reel to reel tape machine we are transferring archive audio tape to digital sound files for Apple mac AIFF files. 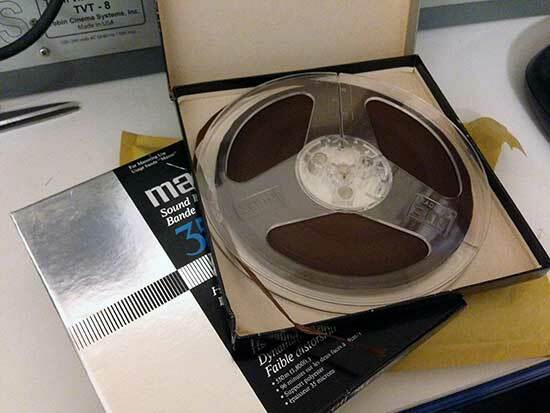 Using very high quality Chord Interconnect to transfer the audio tape to digital ensures the the analogue sound Information stored on the Reel to reel audio tape is not lost during the audio tape to digital transfer process. All of the reel to reel tapes provided where originally recorded at 3 and 3 quarter Inches per second. This is not a professional speed for audio tape recording, so the quality was not as good as some of the reel to reel transfers we have converted to digital. Audio tape to digital capture. All our tape transfers are captured at 96 KBPS for the best analogue to digital transfer quality. Hardware used for audio tape to digital transfer. Video Image Productions utilise Sapphire audio hardware which is know to be one of the best audio capture devises in the Industry. With professional XLR balanced 3.5 Inch Inputs and a Firewire output to the Apple computer, the audio tape to Digital sound transfer is near perfect. Once the audio tape is digitised we load the files into Pro Tools (Industry standard) here the audio files are checked and if necessary normalised so the volume levels remain consistent through out the sound file. One the reel to reel tape is digitised the customer has several audio format options. 2. Sound files transferred to a USB stick. 3 Sound files transferred to Hard disc (In the audio format of your choice) which we can provide or the customer can supply themselves. 4. Data DVD depending of the size of the audio tape to digital files they can be burnt onto a data DVD. Please note data DVD’s hold 4.7 Gig of data.